A sibling is often a blessing in disguise. He can be your best friend one moment and an archenemy the next. Sibling rivalry can get out of hand, though, when rules for behavior are not established early on. 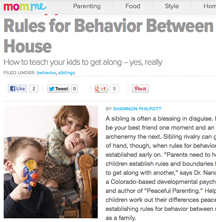 “Parents need to help their children establish rules and boundaries for how to get along with another,” says Dr. Nancy Buck, a Colorado-based developmental psychologist and author of “Peaceful Parenting.” Help your children work out their differences peacefully by establishing rules for behavior between siblings as a family.